Do We Really Know Tropheus moorii? by Ad Konings. 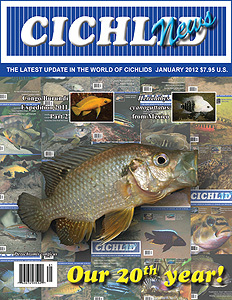 Finally, the correct identification of this iconic cichlid. Burundi and Northern Congo Expedition 2011—Part 2 by Ad Konings. The second part of Ad’s account of his recent visit to this heretofore inaccessible part of Lake Tanganyika. Lamprichthys tanganicus by Eric Bodrock. The author shows us why these killifish are much more than cichlid food! The Texas Cichlid Herichthys cyanoguttatus by Juan Miguel Artigas Azas. Noted Mexican aquarist Juan Miguel shares new observations on the Texas cichlid. My Favorite 6 Cichlids by Ted Judy. The noted fish breeder and cichlidophile shares his favorites.